‘There were a lot of things that ran in families, but murder wasn’t one of them …’Detective Chief Inspector Karen Pirie is an expert at solving the unsolvable. With each cold case closed, justice is served. So when a teenage joyrider crashes a stolen car and ends up in a coma, a routine DNA test could be the key to unlocking the mystery of a twenty-year-old murder inquiry. Finding the answer should be straightforward, but it’s as twisted as the DNA helix itself. Meanwhile, Karen finds herself irresistibly drawn to another case, one that she has no business investigating. And as she pieces together decades-old evidence, Karen discovers the most dangerous kind of secrets. 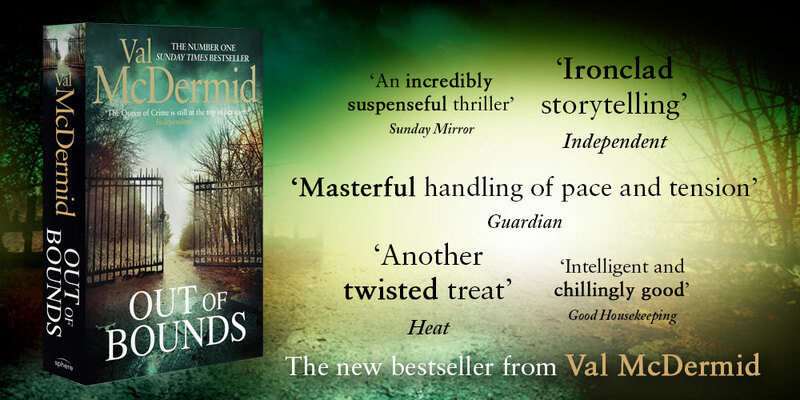 Secrets that someone is willing to kill for …Number one bestseller Val McDermid returns with her most atmospheric, spine-chilling and gripping novel to date. Number one bestseller Val McDermid presents another chilling and suspenseful novel! 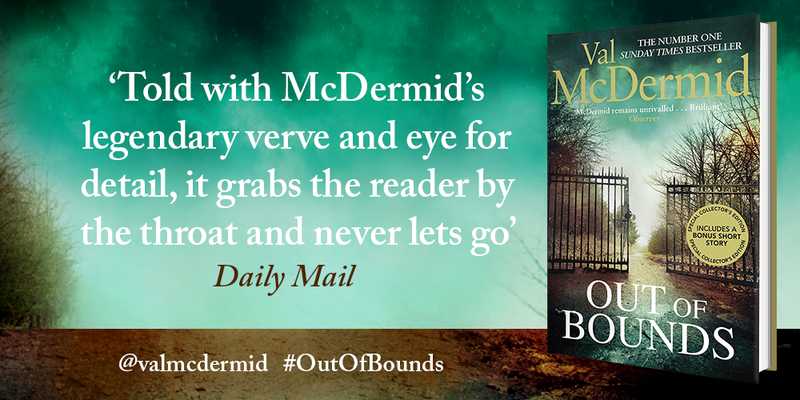 Scottish crime writer Val McDermid’s 30th novel, is a suspenseful thriller called Out of Bounds, with Little, Brown – AVAILABLE NOW! 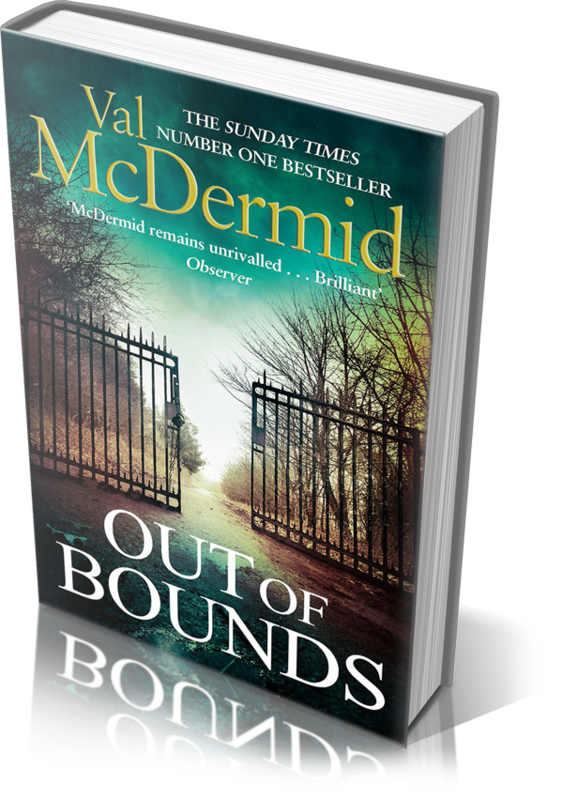 McDermid has sold over 11m books to date, according to the publisher, translated into 30 languages, and in 2016 was honoured with the Outstanding Contribution award at the Theakston’s Harrogate Crime Festival. McDermid’s last standalone novel The Skeleton Road (Sphere) was a number one bestseller in paperback and in the top 10 for three weeks. Her hardback, Out of Bounds, is “a gripping, chilling book” that deals with the way in which families live with the impact of violent crime years after the media have forgotten about their once-newsworthy sufferings. Bringing together grief, terrorism, murder, justice and forensics, the plot takes off when a teenage joyrider crashes a stolen car and ends up in a coma and a routine DNA test reveals a connection to an unsolved murder from 22 years ago. The answer to the cold case is “as twisted as the DNA helix itself”. A mystery rooted in a terrorist bombing two decades ago is also simultaneously investigated. McDermid excels in putting the reader at the center of the action . . . A tightly paced mystery . . . My bones tell me we haven’t seen the last of Inspector Pirie – or at least I hope not.